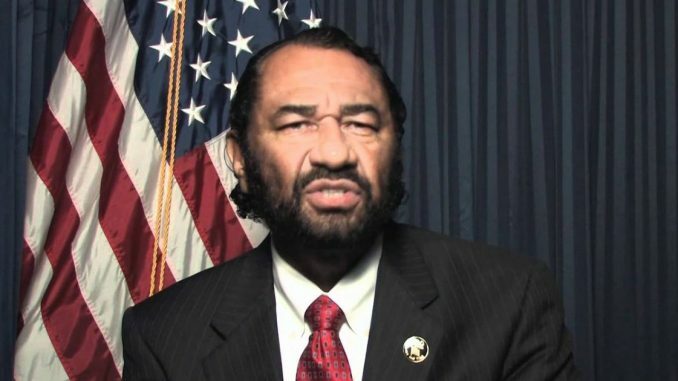 On Thursday, Rep. Al Green, D-Texas, promised to force an impeachment vote against President Trump for — brace yourself — Gov. Ralph Northam’s past bigotry, The Hill and others reported. Northam, by the way, happens to be a Democrat. In short, Green wants to impeach Trump for something done by Democrats in Virginia, even though Trump had nothing to do with any of the allegations against the three Democrats. The Texas Democrat wants it so eagerly, in fact, that he often uses whatever is happening in the news cycle at the moment to argue that the time to impeach Trump is now. It doesn’t matter what’s happening: Rep. Green will find a way to tie it back to his obsession with impeaching the current president. This single-minded pursuit of impeachment has, of course, produced some notably absurd moments for the congressman, including when he claimed this week that the chaos in Virginia is further proof that Trump must be impeached. You read that right: Three Democrats in Virginia get in trouble, so that means the Republican president should leave office. Adams is 100 percent correct in his analysis.
.@RepAlGreen: Virginia’s blackface incidents highlight "imperative to impeach" … Trump. Green, The Hill said, did not indicate when he would force his vote for impeachment. We’re hoping it’s soon, so Republicans can start using it as a political advertisement to show how unhinged and out-of-touch with reality Democrats truly are.